As a general rule your thread should always be the closest color to the fabric as possible. If you have a varied quilt or a brightly colored quilt and want the quilting to be as subtle as possible then a grey quilting thread is best. The more experienced quilter can use contrasting colors to create a bright and noticeable quilting effect, however it is best to stick to muted and similar base colors when you are just starting out. It is always best to use a high quality thread to prevent breakage and damage over time. If the quilt is for everyday use then it is best to use a strong cotton thread. It is always best to match the thread to the type of material you use, for example if you are making a quilt out of fabric that is 100% cotton then use 100% cotton thread and if you make a quilt out of a mix of polyester and cotton then it is a good idea to get a mixed cotton and polyester thread. As cotton thread is a natural fibre it does tend to fray and the ends will often tangle so it is advisable to tie knots at the ends and using shorter lengths when hand quilting. Many quilters prefer to coat the thread in beeswax before quilting which prevents the thread from tangling. 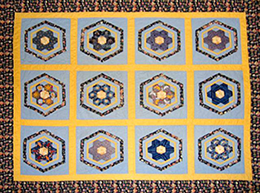 Beeswax will also strengthen the thread and help reduce breakage during the quilting process and in aftercare. Invisible thread is popular for quilting is it comes in clear and also white and a grey color for a variety of fabrics. This thread will conceal the quilting stitches if desired. It is always best to use single lengths of thread (not double) to prevent tangles and knots. If you are wanting to strengthen the thread then beeswax is probably a better idea.